KayKiSpeaks.com: News on Michael Douglas' Battle With Cancer! When we heard that famous actor Michael Douglas was battling late stage throat cancer.. there was a sadness across the entertainment/media world. Michael Douglas is a well celebrated actor... and late stage cancer of any type is considered deadly. The last thing we wanted to do was consider that another well loved celebrity was about to be gone. We've watched him go from looking healthy and vibrant to fairly thin and sickly, but he never complained. 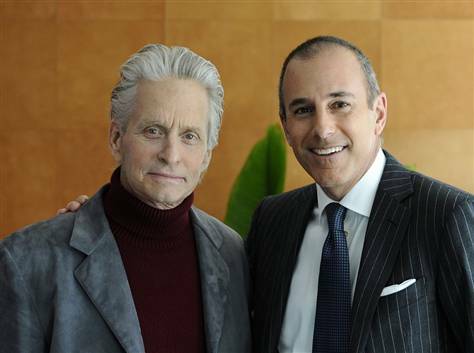 Well Michael sat down with Matt Lauer of the Today Show to update us on his battle with cancer. Michael explained that his doctors revealed that he.. Yes! There is no sign of cancer in him. After suffering through loads of chemo, his body appeared frail, but he seemed in high spirits. According to Dr. O'Malley who offered his professional advice on Michael's diagnosis to MSNBC, for Michael Douglas the next 3 years are critical. Three years is considered the checkpoint to consider a person completely cancer free! So, prayers go out for Michael and his family & I am so happy to learn that he is currently not battling the disease!